Jessica M. Vaughan is Director of Policy Studies and Russ Doubleday is a research assistant at the Center for Immigration Studies. This is a nonsensical situation. These jurisdictions, some of which are home to the largest concentrations of illegal aliens in their state, have policies in place designed to impede federal immigration law enforcement — and yet year after year they ask the federal government to reimburse them for costs associated with a problem that their own policies make worse. And the Department of Justice, the nation’s chief law enforcement agency, is making cash grants to jurisdictions that deliberately inhibit a sister agency, ICE, from doing its top-priority job of finding and removing illegal alien criminals. Since the total amount of grant funding is limited, this practice of subsidizing sanctuary jurisdictions reduces the amount of money available to those jurisdictions that are helping ICE find criminal aliens. As Table 2 illustrates, five of the top 10 SCAAP grants to localities and two of the top ten grants to states went to jurisdictions that are considered sanctuaries. There is an easy fix. Congress should restrict eligibility for SCAAP funding to those jurisdictions that actively participate in immigration law enforcement programs such as Secure Communities, the Criminal Alien Program, or the 287(g) program. These three programs enable ICE, or designated specially trained local officials, to identify and process illegal aliens who have committed local crimes, thus ensuring that at least criminal aliens are not shielded by the local sanctuary policy. Language to this effect has been proposed several times over the years, but was never enacted.3 It was most recently included in a new bill introduced by Sen. Orrin Hatch (R-Utah).4 Such a restriction might deter some jurisdictions from opting out of ICE programs, or at least prevent the sanctuaries from grabbing a share of scarce SCAAP funding with one hand while blocking ICE access to criminal aliens with the other. SCAAP grants reimburse states and localities for a portion of the correctional costs associated with illegal alien criminals — specifically, correctional officers’ salaries. Law enforcement agencies apply for the grants on an annual basis, providing lists of illegal aliens who were convicted of a felony or two misdemeanors and who were incarcerated for at least four consecutive days. Reimbursement is provided according to a formula that calculates the number of illegal aliens reported (and verified by immigration records), the duration of their incarceration, and the cost of incarceration and then divides the funding proportionately among all those jurisdictions that apply. Congress has authorized funding for the SCAAP program through FY 2011, which ends September 30, 2011.7 The Obama Administration has proposed a budget of $330 million for the program in 2011, a decrease of about $70 million from the previous year. During its tenure, the Bush Administration sought to end SCAAP, but Congress restored it to the budget every year. List of Sanctuary Jurisdictions. The cities, counties, and states listed in Table 1 were identified in a variety of reliable sources, including reports from the Congressional Research Service, the National Immigration Law Center,9 news media accounts, and the authors’ review of jurisdictions’ policies. There are many other cities that have sanctuary, or “don’t ask, don’t tell” policies, such as Hartford, Conn., Santa Cruz, Calif., and Cambridge, Mass., that are located within a larger county or state correctional jurisdiction that receives SCAAP funds, but are not be bound by those policies. Some sanctuary cities, like Baltimore, Md., do not receive SCAAP funding at all, and are not listed. 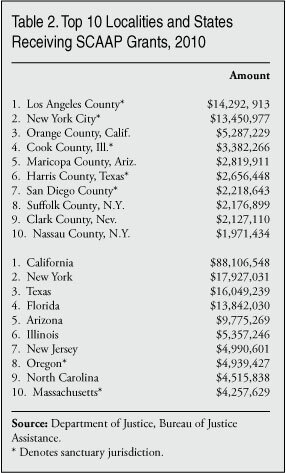 Grantee counties in which a sanctuary city (or cities) comprises 40 percent or more of the county population are included in Table 1. Some states have policies that restrict only state law enforcement officers (such as state troopers) from involvement in immigration law enforcement; others seek to restrict all law enforcement officers in the state from working with ICE, and the grant totals in the table reflect this distinction. 2 Jessica Vaughan, “But We Like Our Criminals, Or, It Depends on What the Meaning of Patchwork Is,” http://www.cis.org/vaughan/secure-communities-opt-out. 3 See Yule Kim and Michael John Garcia, “Sanctuary Cities”: Legal Issues, Congressional Research Service Report RS22773, January 9, 2008, http://assets.opencrs.com/rpts/RS22773_20080109.pdf. 5 Steven A. Camarota and Jessica M. Vaughan, “Immigration and Crime: Assessing a Conflicted Issue,” Center for Immigration Studies, November 2009, Table 4, http://www.cis.org/ImmigrantCrime. 6 Jessica Vaughan, “ICE Program Finds 11 percent of Inmates Screened Are Removable,” http://cis.org/vaughan/secure-communities-stats. 7 Karma Ester, Immigration: Frequently Asked Questions on the State Criminal Alien Assistance Program (SCAAP), Congressional Research Sevice Report RL33431, January 27, 2007, http://www.ilw.com/immigrationdaily/news/2007,0906-crs.pdf.